Kids need crowns, too. That’s why we offer dental crowns just for children. Here’s how it works. A dental crown is a restoration that covers or “caps” a tooth, restoring it to its normal size and shape while strengthening and protecting it from further cracking or breakage. Crowns are necessary when a tooth is damaged by decay to the point that a filling is no longer a treatment option. 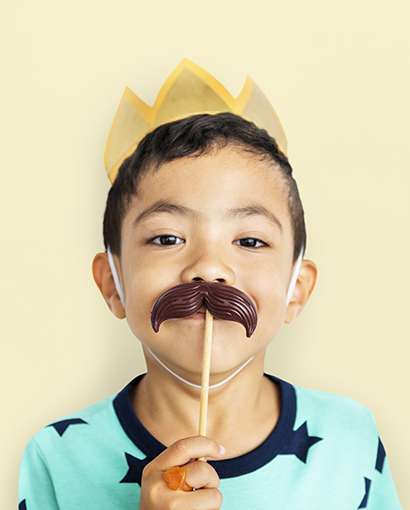 Sometimes when a dentist removes significant tooth decay or performs a nerve treatment, he or she will recommend capping the child’s affected tooth with a crown. Stainless steel crowns are silver caps that cover the back teeth and preserve more of the tooth structure than other types of crowns. They withstand biting and chewing forces well and rarely chip or break. Stainless steel crowns are often used on young patients who are in active occlusion and require a crown that can adapt to an adjusting and growing mouth. White crowns are used to strengthen decayed front teeth. They are commonly referred to as strip crowns, made of a composite resin. White crowns that are used on back teeth are made of a porcelain fused to metal material. These crowns are more commonly used on for adult teeth. They are more rigid and work better when a mouth has stopped growing. White crowns are close in color to the natural teeth, so they are more cosmetically pleasing. Dental crowns for children are generally completed in one visit, and will usually last until they are replaced by adult teeth.